Ba`al arrives in Exodus and he’s still around in the New Testament. Jesus discussed him with the Pharisees (see Matthew 12:22-28). Stela at the Louvre from the ancient city of Ugarit depicting Ba`al with his characteristic mace and thunderbolt. Ba`al isn’t a name, it’s a title. It means “lord”, in the same way we Christians usually say Lord (and our Bibles read Lord) instead of saying Yahweh or spelling out YHWH. That’s rather arrogant, when you think about it. And Ba`al wasn’t the only one; over time, Babylon’s chief god Marduk came to be known as Bel, which also means “lord”. Ba`al has had a long career. He’s not recognized as an active deity in our world today, to the best of our knowledge. There may be a few here and there who try to recreate the old religion of the ancient Canaanites, but like aging pop divas, the old gods reinvented themselves as time and people moved on. We’ve already seen how Sumerian Inanna became Babylon’s Ishtar, the Semitic Astarte, Aphrodite of Greece, and Venus of Rome. Over time, Ba`al replaced the original name of the West Semitic storm-god Hadad (or Haddu), who was also called Adad/Addu by the Akkadians. Ba`al has also been identified with the Hurrian god Teššub, the Hittite god Tarhunt (or Tarhun), the Urartian god Teisheba, the Sumerian god Iškur, the Amorite god Amurru (incorrectly, as it happens), and others. Of course, Ba`al is best known as Zeus—Jupiter to the Romans. The first written evidence of the cult of Iškur comes from the cities Lagash and Adab in the middle of the 3rd millennium B.C. Adab was near Karkara, site of Iškur’s temple, the House of the Big Storms. Unfortunately, the ruins of Karkara haven’t been discovered yet, so we don’t know much about his cult or the local traditions about him. But based on prayers and rituals that have been preserved, it appears Iškur, like most of the Mesopotamian gods and goddesses, could be good or bad depending on his mood. The storm-god brought necessary rain for the crops needed to survive but he could also destroy fields with wind, hail, and flood. He first appeared under the name Hadda at Ebla around 2500 B.C., and as Adad in Old Akkadian texts, the period of history that began with the empire of Sargon the Great around 2330 B.C. We know they’re the same because the Sumerian logogram for Hadda/Adad was the same used for Iškur (dIM). As god of the heavenly waters, Iškur was sometimes praised as the twin brother of Enki. This may be an early example of the “twin gods” motif in ancient mythology. Sometimes they’re brother-sister twins, such as Apollo and Artemis; sometimes divine-mortal twins, like Castor and Pollux; and sometimes, as in this case, a pair of brothers, one more important than the other, at least in the early days. Until the early 2nd millennium B.C., it wouldn’t have been a compliment for Enki, the god responsible for the fresh water of the abzu and the fundamental laws of civilization, the mes, to be compared with a minor deity like Iškur. Iškur-Adad, later Ba`al, played a key role in the cosmology of Mesopotamia for the next 2,500 years. His importance to the cultures of the region grew with the political influence of the Amorites, who may have introduced Iškur into Sumer, reaching its peak in the 2nd millennium B.C. and lasting through the time of Jesus. At Mari, which was located on the Euphrates about 75 miles southeast of the modern city of Deir ez-Zor, a powerful but short-lived Amorite kingdom grew from the ashes of an older state that had been smashed by Sargon the Great. The name Haddu often appears in texts found at Mari alongside Dagan, a grain god (contrary to common belief, Dagan/Dagon was never a fish god), and Itūr-Mēr as one of the three great gods of the kingdom of Mari. As political control of Mesopotamia shifted from Akkad to Ur and then to Babylon between 2150 B.C. and 1900 B.C., powerful Amorite kingdoms in Assyria, Mari, and Yamḥad (modern Aleppo, Syria) emerged alongside the old Babylonian empire. At the same time, the storm-god’s identity gradually shifted from Sumerian Iškur to Akkadian Adad and his importance in the pantheon grew. By the time Hammurabi brought Babylon to the greatest extent of its power, Adad was firmly established among the great gods of Mesopotamia. Meanwhile, the lion-dragon was replaced by the bull as the animal associated with Adad, a symbol more familiar to those who know Ba`al from the Bible. While texts from the Canaanite city-state Ugarit name Mount Zaphon as the site of Ba`al’s palace, the capital of Yamḥad, Halab (Aleppo), was known across the ancient Near East as the City of Hadad. The storm-god’s sanctuary there, which lies beneath a massive citadel in Aleppo’s old quarter, dates to the Early Bronze Age, the mid-3rd millennium B.C. (ca. 2500 B.C. ), and it was in use until about the 9th century B.C. The importance of the storm-god of Aleppo is highlighted by evidence of his cult across Mesopotamia and the Levant, from Nuzi, east of the Tigris River, to Hattuša, capital of the Hittite empire, in what is now north-central Turkey. By the old Babylonian period (1700s B.C. ), Hadad was, other than Marduk, the preeminent god in Mesopotamia. Emissaries from Elam, today’s northwest Iran, once traveled to Halab to present a bow as a gift to Hadad. 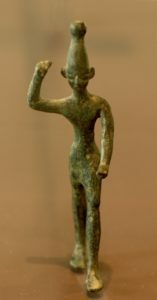 Figurine of Ba`al found at Ugarit. If you’re a reader of the Bible, you recognize that this is another bit of propaganda from the spirit realm. Scripture tells us “there is no [governing] authority except from God, and those that exist have been instituted by God” (Romans 13:1, ESV). It was believed that the sacred weapons forged for Ba`al by the craftsman god, Kothar-wa-Khasis (Skillful-and-Wise, or Deft-and-Clever), to defeat the sea-god Yam were kept at the temple of Hadad in Aleppo. Letters found at Mari confirm that the weapons, clubs named Yagrush (Chaser) and Aymur (Driver), were transported from Aleppo to the city of Terqa for Zimrī-Līm, the king of Mari during the time of Hammurabi (c. 1775 B.C. ), and placed in the temple of Mari’s chief god, Dagan. This is fascinating on a couple levels. First, it’s clear that the clubs were actual physical objects that could be brought out and displayed during ceremonies. Second, the weapons apparently had some ritual function. Whether the clubs were returned to Aleppo, we don’t know, but it raises a disturbing thought: This is sheer speculation, but is it possible that these weapons, whatever they were, still exist, are in Aleppo today, and are somehow spiritually linked to the savage violence of the ongoing Syrian civil war? Roughly 80 miles west of that city, Mount Zaphon, the home of Ba`al’s palace, was known to the Greeks as Mount Kasios. The Greek storm-god Zeus was naturally identified with Ba`al-Hadad, and the aspect of Zeus who reigned there was known as Zeus Kasios (Jupiter Casius to the Romans). We mentioned earlier that Mount Zaphon/Kasios was the site of the epic battle between Zeus and the chaos monster, Typhon, which is a clear parallel with Ba`al’s victory over Yam and his minion, the sea dragon Lotan (the Canaanite name for Leviathan). The victory of a god over the chaos monster representing the sea or, as scholar Robert D. Miller termed it, the storm-god-slays-dragon myth, is a theme that stretches back to Sumer. The Zeus-Typhon and and Ba`al-Yam conflicts were preceded by the Hittite myth of Tarhunt and the dragon Illuyanka, the Indian myth of the god Indra’s defeat of the dragon Vrtra (with a thunderbolt, naturally), and before that, the account of Marduk and Tiamat in the Babylonian creation epic, the Enuma Elish. In the god lists found at Ugarit, which serve as a lexicon between Ugaritic and Akkadian, Tiamat is equated with Ba`al’s nemesis, Yam. After his victory over Tiamat, Marduk, like Ba`al, was declared king of the gods and had a palace built in his honor. Some scholars have observed that because no copy of the Enuma Elish predates the tablets containing the Baal Cycle found at Ugarit, and it probably originated no more than two hundred years before the Baal Cycle, the storm-god-slays-dragon myth may have traveled to Babylon from the region around Mount Zaphon and not, as is generally assumed, the other way around. This makes a lot of sense. It’s far more likely that people near the Mediterranean would envision the sea as a monstrous opponent of the gods than the inhabitants of arid central Mesopotamia. As we mentioned earlier, the Sumerian storm-god Iškur may well have been a Semitic import. The Amorites were in contact with southern Mesopotamia from an early age. As with the belief that the storm-god was king of the gods, the account of his triumph over chaos may have traveled west to east with Amorite caravans. Of course, these tales were a PSYOP to lay claim to the victory that Yahweh had won over Leviathan and chaos. Thus says Adad, I brought you back to the throne of your father, I brought you back. The weapons with which I fought Tiamat I gave to you. With the oil of my bitter victory I anointed you, and no one before you could stand. In the beginning, God created the heavens and the earth. The earth was without form and void, and darkness was over the face of the deep (tehom). And the Spirit of God was hovering over the face of the waters. Linking the Sumerian chaos goddess, Tiamat, and “the deep” of Genesis 1:2 puts that verse in a new light. Why did the Spirit of God hover over the waters? Is it possible Yahweh defeated a divine rebel before creating Adam and Eve? And having cast Tehom/Tiamat into the abyss, did His Spirit remain to guarantee the monster would stay there? Thus, the creation of the world as recorded in Genesis is linked to the Enuma Elish, the Baal Cycle, and the storm-god-slays-dragon myths of ancient Anatolia and Greece, and probably the nightly contest between Set and Apophis, the Indian myth referenced above, the battles between Thor and Jörmungandr, and others. Not surprisingly, scholars generally believe the biblical account was inspired by the Babylonian myth instead of the other way around—as we said, a PSYOP. Remember, the oldest written account isn’t necessarily the one that’s true.